Published Aug 17, 2016 By Julia 16 CommentsThis post may contain affiliate links. 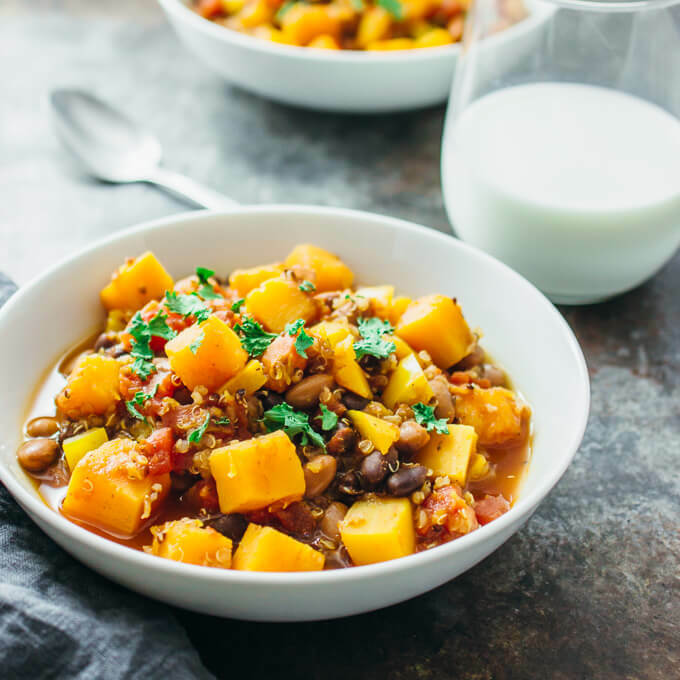 This butternut squash chili is one of my favorite chili recipes! 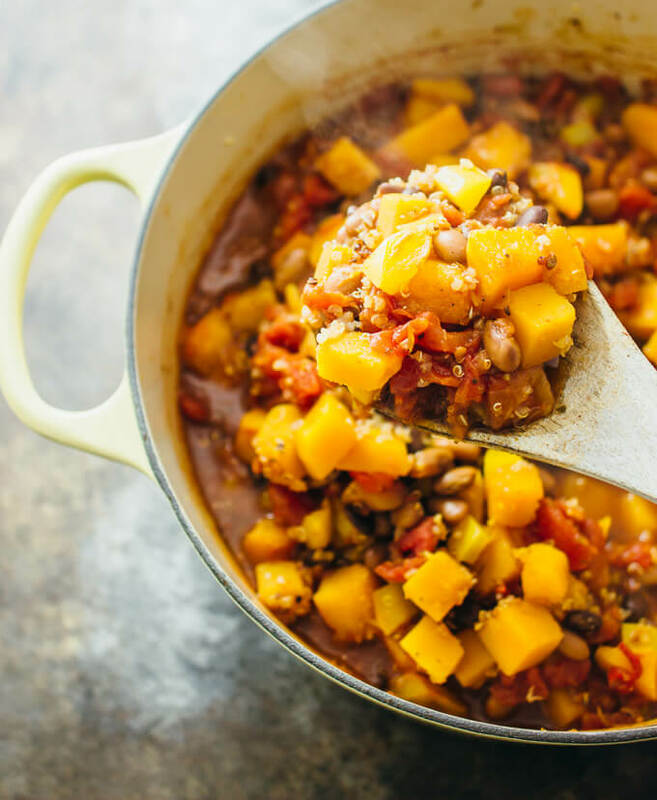 It’s easy and fast (cooks in 30 minutes on the stove), and it’s a great way to incorporate fall favorites like butternut squash into your diet. This vegetarian/vegan dish is also healthy and includes quinoa, black and pinto beans, and peppers. I first developed this recipe last year on one of those cold winter days. Since then, I’ve made a few tweaks but it’s essentially the same: thick and hearty vegetarian chili that’s chock full of delicious vegetables, fun spices, and hot peppers. Sometimes I’ll add tasty toppings like avocado chunks, Mexican blend cheese, or scallions. Also, this dish makes for amazing leftovers. When I first made this, I found myself coming back to the fridge again and again to get more bowls of this chili. It’s kind of addicting. This meal is also perfect for cooking up on Sunday to prepare for weekday lunches and dinners. You can make this ahead of time, refrigerate, and it’ll keep for 5 days in the fridge. This recipe yields 5 hearty servings, and if you end up pairing this with tortilla chips or whatnot, then it’ll last you through even more meals. 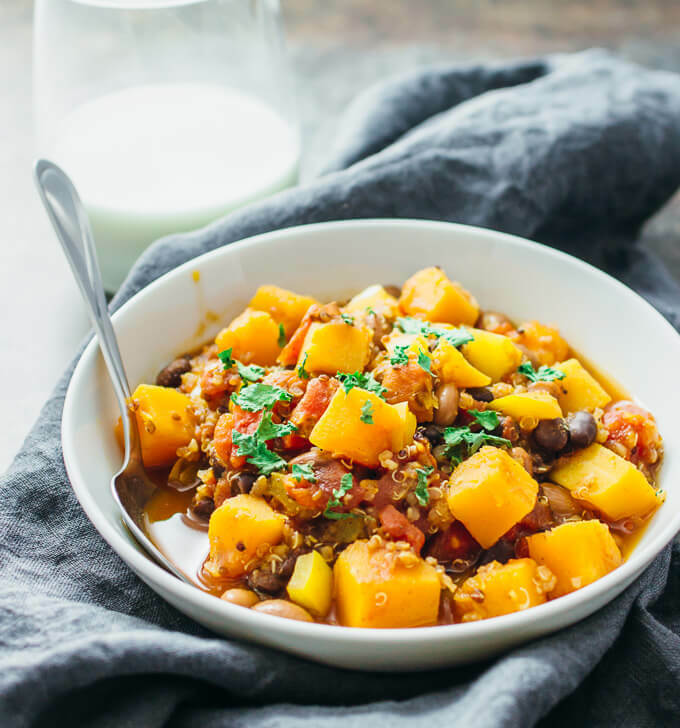 This butternut squash chili is one of my favorite chili recipes! 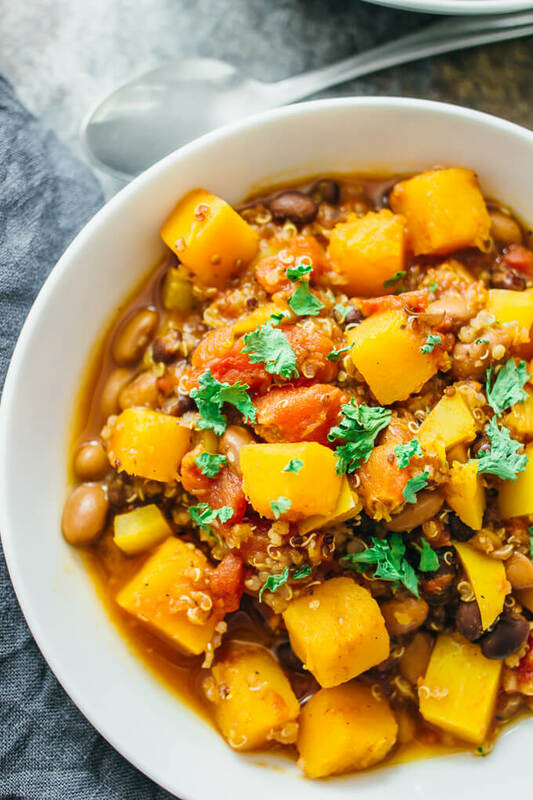 It’s easy and fast (cooks in 30 minutes on the stove), and it’s a great way to incorporate fall favorites like butternut squash into your diet. Heat 2 tablespoons of vegetable broth in a 5-quart dutch oven over medium heat. I made this recipe today. I liked the idea in general, but needed some tweaks to make it taste like chili though. First, I sauteed garlic, onion and celery, added the squash, beans, and tomatoes. Then I added some zucchini and mushrooms. Spices added were liquid smoke, smoked paprika, cumin, chili powder, oregano, coriander, garlic powder, cayenne pepper and more salt. NOW it tasted like chili! Does this recipe freeze well? I’ve made this a couple times already this fall, and I’m wondering if will make a good freeze ahead meal to pull out later in the winter. Not sure how squash does in the freezer! Didn’t change a thing and it was amazing! Gonna be a fall/winter staple meal. Thanks. To the recipe, I adjusted to two onions, two green peppers, added a bunch of spinach. I added an entire head of roughly chopped garlic. I bought low sodium chopped tomatoes and black beans. I substituted pinto beans for can of vegan refried beans (seasoned mashed pinto) to increase heartiness and richness. I also added a cornstarch slurry at the end to thicken to product. I also cut out the quinoa completely. Delicious! Thanks for this recipe! You’re welcome! I’m glad you were able to customize this recipe to fit your preferences. Going to make a variant of your recipe pretty much RIGHT NOW! 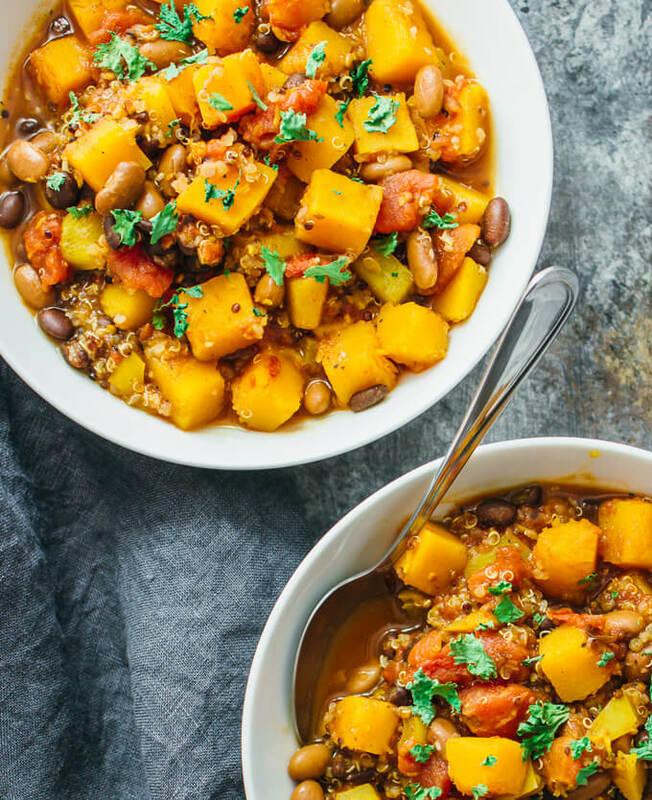 So excited, I was going to throw together just a regular veggie chili, with some butternut since I have a pile but the addition of quinoa is a great idea! I’ll be doing that for sure 😀 I’m thinking of just adding 1/2 up dry quinoa in with the mix to let it thicken up the chili, we like it thick and chunky! Hi Julia – Have you tried this recipe in the crock pot? What changes would you make for the crock pot? Thanks! Thank you! I will! I made this tonight. I’m not a huge chili fan, but I LOVE butternut squash. This is absolutely wonderful. So delicious! Best part is the peppers in adobo, paprika and cinnamon. I highly recommend for anyone looking for a good fall recipe. Thanks for such a great dish! I absolutely love this recipe! It sounds delicious. Butternut squash has such a great flavor, and this would be perfect for my weekday healthy lunches. This sounds delicious! One clarifying question: when you say two pounds of squash, do you mean two pounds before you cut it up or two pounds after you cut it up? Hi Jana! I mean 2 pounds before cutting it up.